After our trip to New Orleans and the veritable smorgasbord of delicious foods that passed our lips, we were eager to try our hand on some Southern staples. Shrimp and grits seemed like a good place to start. Grits, a dish thought to have derived from traditional Native American fare, are actually traditionally served at breakfast. We had it as an appetizer before a gumbo and cornbread main course. In a skillet over medium heat, add tbsp of oil/butter to the pan followed by the shrimp. Season with salt and Cajun seasoning, and sauté for 3-4 minutes. Set aside. Add garlic, parsley, bell pepper, and green onions to the pan. Add about ¼ cup (or more depending on your preference). Continue cooking for another few minutes. Add shrimp, adjust seasoning, and remove to serve over grits. Add water, milk, and bay leaf to a pot and bring to a boil. Gradually whisk in grits, a little at a time, until it is all added. Whisk to prevent lumps from forming. Reduce heat to simmer and cover, stirring frequently, until water/milk is fully absorbed and grits thickened, about 15 minutes. Remove grits from heat and stir in butter and cheese, stirring until the cheese melts. Serve hot. A few notes on preparation: Grits, which are typically a coarser grain than cornmeal, are basically impossible to find in Canada, so we substituted yellow cornmeal. I was pleasantly surprised at how delicious our attempt at shrimp and grits turned out to be! Grits were creamy and tasty–the cheese was definitely a worthwhile addition. Without it, it was a bit on the bland side. 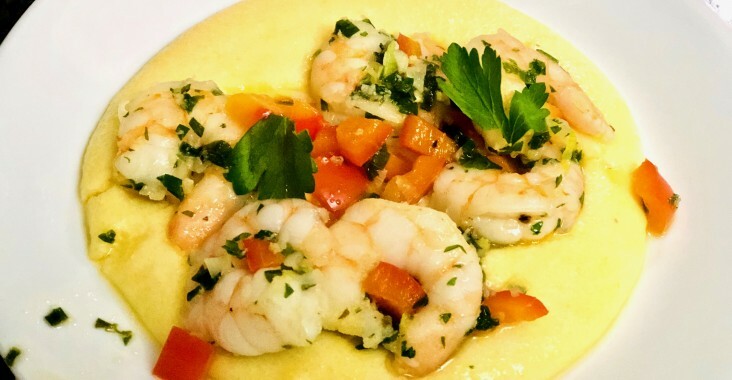 The shrimp were light and refreshing against the heartiness of the grits. I could see adding a bit more broth next time to have more of a sauce with the shrimp (though certainly not a necessity). A relatively easy and filling meal that I’d be happy to re-visit!